Vernon Ingemarson, also known as "Sailor Vern"was born May 26, 1919. During the course of his career Vern worked on both the East and West coasts. In the late 1940s he spent some time in Norfolk, Virginia with "Cap" Coleman, and it was there that he and Paul Rogers first met. According to health department records, in 1947 Vern open his own shop at 512 East Main Street, Norfolk, just down the street from Coleman. I first met Sailor Vern in the late 1970s. At the time Vern was living in San Francisco and working as a night watchman. Dean Dennis in Alameda, California was tattooing me and Vern would come by Dean’s shop and hang out in his off hours. When we first met I was still a collector of tattoos -- that is to say I had not yet started tattooing. 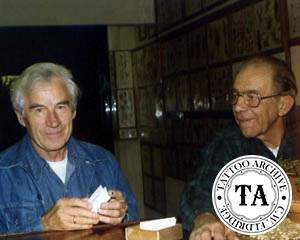 Vern was a soft-spoken and friendly man who was full of stories of his days tattooing in Norfolk, Virginia during the 1940s, a period we now think of with fondness. Coleman, Rogers, Grimshaw, Miller, Sturtz, Barr, Wills and Connelly -- all tattooists known today by a single name and all working in Norfolk during Vern’s time. Vern was able to rub shoulders with the best that the East Coast had to offer. Vern was no slouch himself. He was a student of the “Coleman School” of tattooing and his flash measured up to the best in the business. His art away from the tattoo world was full of life and showed a keen eye for layout and proportion. Like Paul Rogers, Sailor Vern built tattoo machines and credited much of his machine building knowledge to Coleman and Barr and to machinist Don Miller. Vern’s machines were unusual in that they were hand-made from ½ x ⅛ steel bars and his single upright frame design was versatile and could be built as a left or right-handed machine. The machines were well built with a collet style tube binder that was not all that popular. 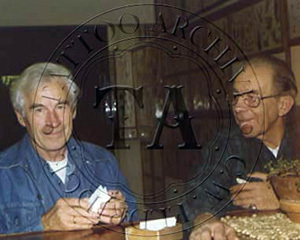 After Vern’s untimely death in June 21, 1988, his wife Ada sold Vern’s sizeable collection to “Calamity Jane” Nemhauser. 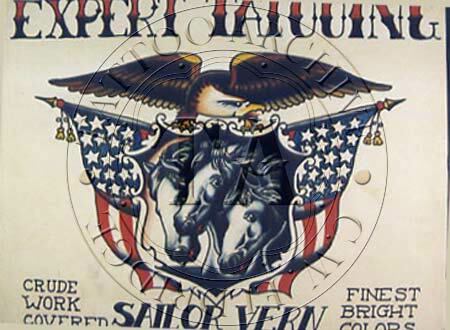 For more on Sailor Vern, see Yellow Beak’s publication Sailor Vern published in 2014.